MK Industrial Suppliers is a leader when it comes to delivering quality products from trusted manufacturers. With us you will find industrial tool supplies that have been ethically sourced from A-listed manufactured who are globally acclaimed for their quality products. Amongst other companies that we have collaborated with Fenner Drives is a name that cannot be missed out on easily. It happens to be one of the most trusted brands in the global engineering community. Fenner Drives is a downright expert when it comes offering products that have problem solving and value adding characteristics. Over the years they have built a wide product range that can efficiently facilitate motion transfer, power transmission and application conveyance. At MK Industrial Suppliers we recognize ourselves as the best fenner v belt distributors as we source the products directly from them and deliver them to you. Temperature Resistant to high temperatures. Operates effectively up to 116˚C (240˚F). Abrasion High resistance to abrasion. Chemical Resistance Resistant to oil, grease, water and most agricultural chemicals and solvents. 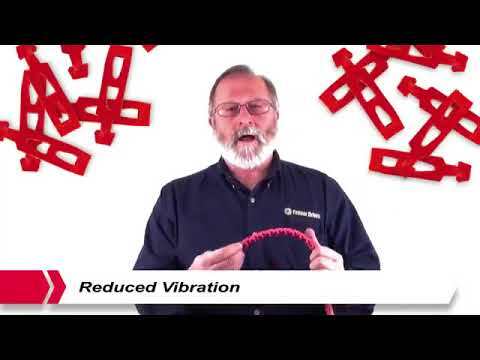 Vibration Individual link design dampens vibration by up to 50% which reduces noise and increases component life. Belt Stretch After initial run-in where the links become seated, PowerTwist Plus has insignificant elongation and does not require regular retensioning. Ideal for drives with fixed centers. Installation No need to dismantle components, belt can be fed through and assembled on the machine, belt can be rolled on, no tools required. Easy, fast installation on captive drives. Inventory Can be made to any length needed. No need to stock specific lengths. One box of each section/type covers all lengths. Matched Sets Matched sets can be made on demand with same number of links in each belt. Driven by a strong core value for innovation, this brand is the right choice if you are associated with the engineering industry. We are only a call away if you require products by this brand. MK Industrial Suppliers laid its foundational stone back in the year 1988 and since then we have been recognized as one of the premier industrial suppliers in Pune. Shop No. 9, Laxmi Plaza S. No. 412, Kasarwadi Opp. Alfa Laval Mumbai - Pune Road Pune- 411034. Maharashtra, India.